Big Miller on the cover of the August 1980 edition of the Edmonton Jazzette. That shirt is due for a comeback. Photo provided by the Yardbird Suite. Generally speaking, the ol’ City of Champs hasn’t been known as an international hub of art and culture as say, Montreal, New York City or Los Angeles. Artists of all stripes – musicians, dancers, visual artists – tend to get their feet wet in Edmonton then head off for the greener pastures of large international centres of creativity. So to hear stories of popular artists choosing to do the opposite and actually move to Edmonton to pursue creative endeavours (in the 1970s no less! ), well, that’s something worth exploring. Who are the heritage heroes in your community? Help us celebrate the outstanding contributions of Albertans to the promotion and preservation of Alberta’s heritage. Nominate an individual, organization or project for an Alberta Historical Resources Foundation heritage award. Complete your nominations now. Deadline for submission is July 15. Awards will be presented in the Heritage Conservation, Heritage Awareness and Outstanding Achievement categories. In addition, the Foundation is proud to introduce the Indigenous Heritage and Youth Heritage Awards this year. Awards will be presented during an awards ceremony on October 25, 2018 at the Government House in Edmonton. Tomorrow, the Historic Resources Management Branch is glad to celebrate National Indigenous Peoples Day. Held each year on June 21 and renamed last year from National Aboriginal Day, National Indigenous Peoples Day recognizes the historic and present-day contributions, success and cultures of First Nation, Inuit and Metis communities across Canada. Edmonton is once again hosting the free-to-attend Indigenous Peoples Festival, this year in Victoria Park from 11:00 AM to 8:00 PM. The event includes a pow-wow, main stage concerts, artisan marketplace and food vendors. There are also events throughout the week at City Centre Mall, Edmonton International Airport and the Art Gallery of Alberta (free admission on June 21 for all visitors as well!). In Calgary, there are performances, displays and workshops at both the National Music Centre’s Studio Bell and Arts Commons, or venture west to take in the parade in Canmore or an evening medicine walk at the Banff Centre with Metis guide Brenda Holder. In southern Alberta, Head Smashed In Buffalo Jump is offering special programming, with opportunities for guided tours, performances, food sampling, and story sharing with Blackfoot Elders. There are celebrations in communities across the province: check this listing to find the gathering closest to you. Is your community hosting an event for National Indigenous Peoples Day? Leave a comment on this post with the details! On this day, and all days, we express our gratitude to the Indigenous communities in Alberta that we have the privilege of learning from and working with. Your history, culture, stories, goals and perspectives make our understanding of Alberta’s heritage so much richer. Title Image: Driftpile Cree Nation Pow Wow. Photo credit: Ron Ganzeveld, Government of Alberta. Thank you to guest writers Simon Evans and Peter Peller for this interesting and informative post about Hutterite arrival in Alberta. This blog was drawn from an article originally published in Alberta History Magazine titled “The Hutterites Come to Alberta” (Alberta History, Vol. 63, No. 4, (Autumn 2015), 11-19). South Dakota Hutterite Colonies, 1917. Hutterite Colonies along the Rosebud River, 1918. Hutterite women and children at the new Springvale Colony on the bridge over the Rosebud River, March 1919, construction activity still evident. (Glenbow, NA 4079-75). Thank you to our guest author Ashley Henrickson for this interesting post. Ashley is a M.A. student at the University of Lethbridge and the Museum Educator at the Galt Museum and Archives. Her research examines the experiences of young people living in the Canadian Prairies whose fathers or brothers served overseas during the First World War. Ashley received the Roger Soderstrom Scholarship in 2017. The funds from this scholarship allowed her to visit archives across Alberta and present her research at “Children, Youth, and War,” a symposium hosted by the University of Georgia. A never-ending cycle of children, chores, and neighbors cut through Isabelle Brook’s home, constantly interrupting the letters she wrote at her kitchen table. Isabelle apologized for her “jumbled up” proses as she paused to prepare dinner, answer the door, or tend to her busy children: “Alice is here wiggling around like a little eel, so I must quit”; “Gordon is wakening up I must go”; “Glen’s upset the ink over the table cloth now.” The constant movement suggests that life for Isabelle and her five children may have been lonely without their father, but it was not dull. The hundreds of “jumbled up” letters that Isabelle wrote from her kitchen table in Craigmyle, Alberta, are a valuable and vibrant record of Alberta’s past. She sent these letters to her forty-five-year-old husband, Sidney Brook, who served on the Western Front with the Canadian Expeditionary Force from 1916-1918. In response Sidney sent hundreds of letters to his family, which were preserved alongside Isabelle’s by their descendants and then donated to the Glenbow Archives. The Brook’s collection is especially valuable because very few letters sent from families living in Alberta to soldiers serving overseas have survived to the modern day. This is because soldiers, like Sidney, were constantly moving across the Western Front and had to carry all their personal belongings with them. This forced them to destroy all but a few precious letters that they could fit in their pocket. 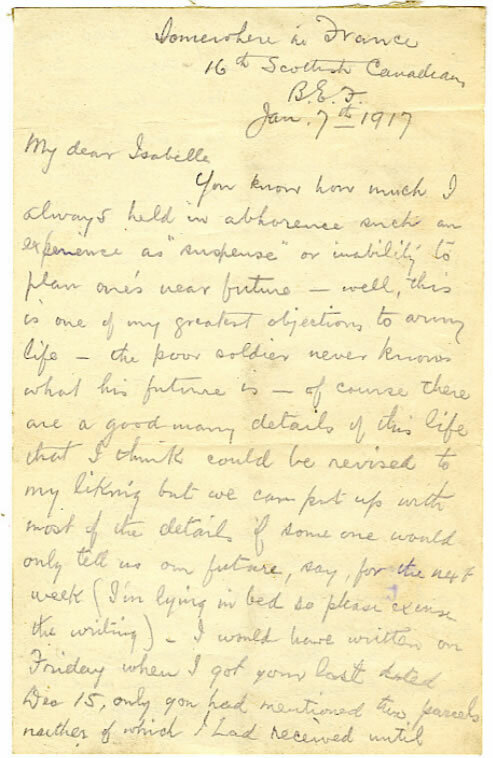 Letter from Sidney Brook to his wife Isabelle, January 7, 1917 (from the Brook family fonds, Glenbow Museum and Archives, http://www.glenbow.org/collections/search/findingAids/archhtm/brook.cfm).